• While Crockett never lived in Madison County, AL, he frequently came to the area. In the early days he came with Colonel John Coffee and Andrew Jackson. His name appears when describing skirmishes, parties, and meetings. 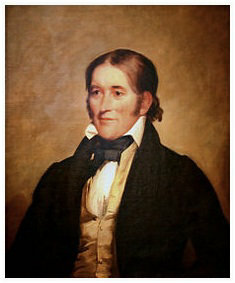 In 1828 Crockett broke ties with Jackson and became a Whig for the remainder of his political career. • He is commonly referred to in popular culture by the epithet "King of the Wild Frontier". • His motto was, "Be always sure you are right, then go ahead." • Helion Lodge #1 - There are records of Crockett's visits to Huntsville's Masonic Lodge. • Laughter - Biographical information including a mention of Huntsville Compiled by Margaret Nolen Nichol of Jacksonville, Florida, © 1998-2001. • Teach American History - Collection of information, photos, and stories. • University of Virginia - Short Bio. • Wikipedia - Bio and portrait. • Wikiquote - Famous Crockett quotes. • Abbott - Book titled "David Crockett: His Life and Adventures" by John S.C. Abbott, originally published in 1874, completely digitized and available here throuogh the University of Viginia Library..
• eBay - Almost 3,000 items on eBay related to "Davy Crockett". Most items are Disney Collectibles. But there are also a hundred items claiming to be biographical. This page was last modified on 1 September 2012, at 16:22.